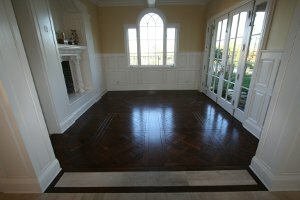 We had the pleasure of speaking with Marc McCalla, owner of award-winning Craftsman Hardwood Floors, Inc. Marc is an experienced and recognized craftsman specializing in designing advanced installations with wood and stone flooring that are both durable and innovative. Marc received the prestigious “Best Member’s Residence Design Award” by the National Wood Flooring Association. 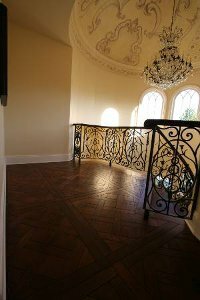 In this article, Marc graciously shares some of his wood flooring experiences with us…and explains the importance of working as a team with other contractors and ongoing challenges he faces with the fluctuation of humidity in California. He also discusses how he manages projects subjected to those conditions. “In areas of Santa Clarita and within 30 – 35 minutes of the coastal communities, there’s such a fluctuation. We don’t get a lot of rain in California. Our installation practice that we do here is very dry. You have to plan and continually check that you’re not building in too much expansion. Sometimes people want to install wood floors that are too tight and it’s going to buckle…even though they’ve checked the moisture content of the floor and it’s within 4% and they feel comfortable installing. 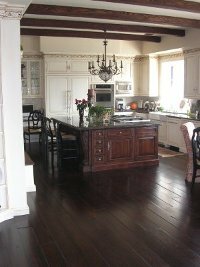 But as you gain relative humidity inside the house, all the moisture in the air settles on the floor, the floor absorbs the moisture and the wood floor will grow and begin to buckle. A slightly loose floor is always better than a floor that’s too tight. A floor that’s too tight is going to grow and begin to cup or buckle. What we’ve learned is that you build in a little bit of expansion. We use shims…smooth-black-metal shims that we use as a growth increment. We take our moisture meter and check the subfloor, check the hardwood and we like to be within 2%…but sometimes, that’s really difficult and unobtainable. In areas where it’s very dry, I try not to use more expansion. Up in Santa Barbara, the relative humidity is generally about 70%. So if you install a floor, even right now in October, their heating cycle is starting to cool down. What you have to do is build for the next summer. 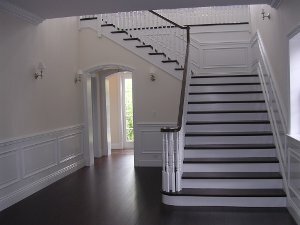 Even though your acclamation and percentage rates state you can install your floor. 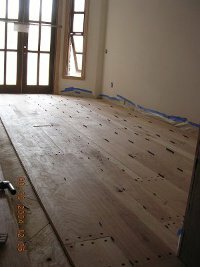 We build expansion into the floor…and with every three or four rows, we insert a piece of expanding material which may be a 16th of an inch wide. We then cut them into pieces that are 3 inches wide and stagger them every 9 inches apart in each place where there’s a joint in the wood. We continue with the entire row, all the way down from one side of the room to the next. 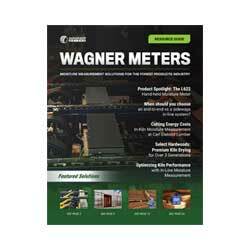 Minimize your risk of catastrophic floor failure with one of the most respected moisture meter manufacturers in the industry and call Wagner Meters today!